On behalf of the board, we thank those who have supported the foundation in the past, in the present and for their vision of the future. 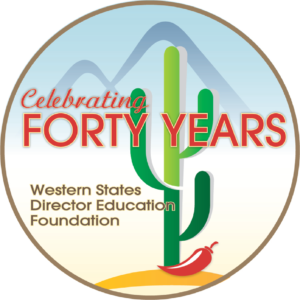 In the fall of 2016 the Western States Director’s Education Foundation celebrated the 40th year of the Symposium for Community Bank Directors. The Foundation was founded by several members of the New Mexico School of Banking in the fall of 1976 and was named the New Mexico School of Banking Foundation. Henry Jaramillo, Jr., President of Ranchers State Bank in Belen, NM, and Don Simonson, the Director for the New Mexico School of Banking, created and led this initial program. The primary and most important factor in forming the foundation was to aid and assist the Banking School in study and research of banking issues. Henry Jaramillo granted the initial funds for the foundation in trust, thus, the foundation was formed. Mr. Jaramillo was unanimously elected as the Chairman of the Board in the first official year of 1977. The other original directors were: Cyrene Mapel, Dean Robert H. Rehder, William H. Vernon, Sam D. Young, Jr., Kenneth C. Bonnell, H. Eugene Adams, Gaylord Freeman, and W. Robert Nicks. The foundation would offer regularly scheduled intensive two or three day short courses at the New Mexico School of Banking facilities located on the campus of the University of New Mexico in Albuquerque. Nationally known bankers and educators staffed the courses. The attendees had ample opportunity for discussion with the staff and fellow directors in class, at mealtimes, and during social activities. During the years, the board members, the name of the foundation and the schedule has changed, but the intent of educating directors and senior officers still remains. Our primary goal is to organize an annual dynamic program that educates and informs community bank directors and senior officers about current topics presented by industry leaders. The directors are still given the opportunity to network and exchange ideas with other directors, find old friends and make new friends.